Lola Warren specializes in obedience training and creative problem solving for puppies and adult dogs﻿. She has over 15 years working experience and is a certified dog trainer and works as a mentor through the Animal Behavior College. In 2012 Lola was awarded Volunteer of the year by the Southside, Arkansas Mutt-i-grees program. Lola Warren is a Certified Dog Trainer through the Animal Behavior College. "I didn't know it at the time, but I began my training as a professional dog trainer while in undergraduate school. I lived in an apartment and despite advice against it, I decided to buy a Jack Russell Terrier puppy as a companion dog. I wanted a small, smart dog that was easy to train. What I got was a holy terror! He ate EVERYTHING! Ink pens, furniture, clothes, pillows, rugs, toilet paper, cords and wires... He jumped onto the furniture, the kitchen table, kitchen counters (stealing food and shredding napkins)... If the door opened he would bolt outside and play "catch me if you can!".... He jumped up on people, he mouthed my hands and legs, bit my pant legs and skirts, tearing the cloth.... And despite my consistency and determination (reading every dog training book I could get my hands on), I could not for the life of me housebreak him. He peed and pooped EVERYWHERE, including on my bed!!! 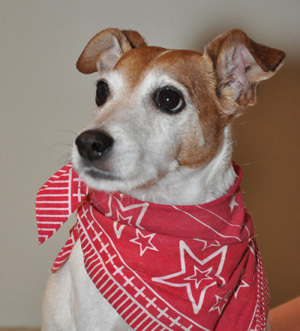 "I became so frustrated and stressed that I, regrettably, decided to give him up to a Jack Russell Rescue. (An organization that finds new homes for this specific breed of dog.) With tears in my eyes that I was giving up on this little guy, I went to the website to download the Jack Russell re-homing form. When I clicked the link a pop-up window came into view. "Have you tried taking your dog to obedience lessons?" It read. Frustrated at the pop-up, I clicked off of it. But when I did, another window immediately replaced it. "Before you give up on your friend, consider taking him to obedience lessons."... Again I clicked off of the pop-up. Again another one, "This is your last chance. Obedience lessons could save this dog's life and change yours forever." I thought about it for a second.. and decided, "Well, that's the one thing I haven't tried yet." "I enrolled in a local Dog Training Club and began the 9 week lesson program. I was very determined and listened to everything the instructor told me. I went home each week and repeated the lessons over and over with my dog. About two or three weeks into the lessons, my dog's behavior began to change. He started to pay attention to me. He started to listen. He began to sit on command. To lay down. To STAY! He no longer bolted out the door. He began to potty outside. He would come running when I called him. I would have called it a miracle, but it was really learning and applying a disciplined plan of consistency that the dog understood. "I have since obedience trained every dog I've ever owned. The result has been over a decade of loyalty, trust, respect, fun and a completely rewarding relationship with all my dogs. Despite how rotten and out of control you might think your dog is, don't give up on him! Obedience lessons could save your dog's life and change yours forever.